Benjamin Sunderlin, an ND student who is perhaps the only living traditional bell maker in the United States. Listen to how easily he talks about the merging of art, history, politics, spirituality, and Notre Dame. 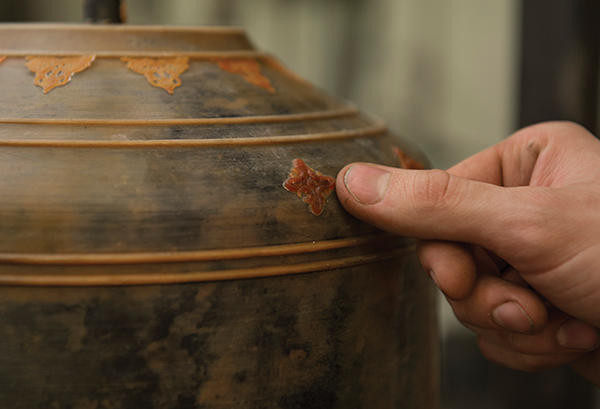 Ben applied in 2012/13 for a Nanovic Graduate Travel and Research grant to delve into bell-making methods in France, where the tradition is still alive. As a result of his research, Ben presented his research last April at a graduate student conference in Ohio and Notre Dame Magazine created the following article and video on his work. Benjamin Sunderlin crouches on Riley Hall’s basement floor, a dollop of what looks like refried beans in his hand, frosting a bell-shaped cake about 3 feet tall. Grooves traced by Sunderlin’s fingers form slender hoops around the cake’s circumference. Another layer and he’s done. After a year of work, from concept to research to design and beyond, the only tasks left are to wrap the cake in chicken wire, bake it, melt out its waxy middle and fill it with molten bronze. Of course, Sunderlin isn’t making a cake. He is making a bell. More precisely, he is making the loam mold for his Notre Dame bell, the Bell of Good Faith. When it is cast it will feature images of Fathers Sorin and Moreau, Christ and the Virgin Mary, and a poetic inscription written by the MFA candidate in Notre Dame’s Department of Art, Art History and Design. Stars and eagles will form the 200-pound bell’s decorative crown, an American contrast with the dolphin crowns of the French bells in the tower above the Basilica of the Sacred Heart, where Sunderlin, 27, hopes he might one day see it placed. Most important, he’s designed the bell to make a beautiful sound, clear and mellow. But the artisan is serene about the use of his artifact. Perhaps it will go to the University’s sculpture park? Maybe it will be a freestanding bell rung to announce some kind of Good Faith award? As Sunderlin explains his project, he dips his crusty hand back into a tall, cylindrical mixer. He speaks of bells he’s made and bells he’s rung, and his brief apprenticeship at England’s venerable John Taylor & Co., where he got his “hands in the horsemuck” and learned more about his craft, bellfounding. Near his feet sits a pile of bronze shards, a bell he broke with a sledgehammer to harvest its heavy metal and recast it for a Catholic church in Missouri. He talks about a potential client half an hour away in LaPorte, Indiana, that needs someone to tune its historically significant carillon. As the storyteller’s enthusiasm crescendos, it strikes me that he knows the pedigrees of bells and their makers the way an old jockey knows horses and trainers. Know this about Benjamin Sunderlin: What he is doing in the June sunshine flooding in through Riley’s loading-dock doors isn’t happening anywhere else in the United States. No one else has a clue how to do it, including his Notre Dame instructors. Instead, Sunderlin is teaching himself the thousand-year-old art of bellmaking. So he’s added classes in church architecture and medieval history to his studio courses, and he values Notre Dame as the kind of place that will support his quest. Father Martin Nguyen, CSC, ’88M.Div., a painter and art professor, says Sunderlin is the kind of student who seeks insight from the outside, the kind of American who needs to go to England or France to appreciate his own country. “It’s very personal and vast,” he says of Sunderlin’s work. What Sunderlin’s after is the reclamation of a lost American craft and the creation of a new American sound. You might also say that this lanky art student with a preference for dark jeans, rolled sleeves and wedge-soled, steel-toed Wellingtons is finding himself in the foundry in Riley Hall. Sunderlin makes large bells. Not the shiny kind with the slender wooden handles that choirs ring at Christmas Mass, but the varieties that hang in towers and evoke old Europe and the voice of God, and which weigh dozens or hundreds or even thousands of pounds. A tattoo on his right arm commemorates the date he first pulled the rope on an impressive bell — the 11-ton Great Peter in England’s York Minster cathedral on March 8, 2011 — to mark the hour. Sunderlin’s bells are yet a fraction of that size. What matters is that he understands how Great Peter was made. Given the right foundry and equipment, he could one day make such a bell himself. 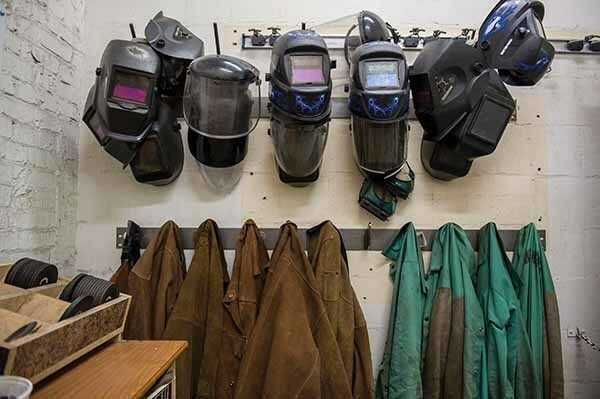 At Notre Dame, Sunderlin and a business partner, JJ Smith, who make most of their own tools, had to fashion a new furnace that could melt up to 300 pounds of metal. When Sunderlin graduates, they’ll start their own shop. 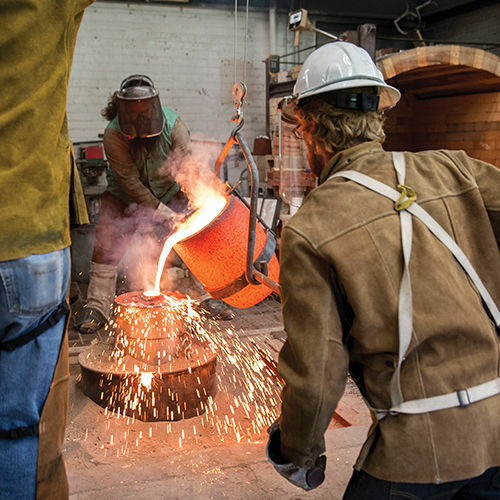 For now, larger jobs go to an all-purpose foundry near Chicago. The work can be grueling, so Sunderlin toils lightly on several projects at once. During the summer, when he doesn’t have to take or teach classes, he splits his 12-hour days in Riley between the foundry and his office, a place he calls a “cabinet of curiosities,” where visitors may ask about the cannon barrel he forged, or his sack of pre-1982 pennies, or the heavy, bronze mortar and pestle. Or, strewn about the shelves and floor, a mess of bells. For Sunderlin, bells are a way to understand the world and its history; the connections between landscapes and national identities, between metallurgy and music, between the soaring aspirations of the spirit and that which lies just beneath the surface of the earth. Cannons, pennies and pestles, with alloys so similar to bell metal, are just some of his teachers. History — since what he makes may endure for centuries — will be his final judge. Here in his office, when his back is sore, Sunderlin reads or writes or tinkers a while on design software. Soon, he’ll amble down the hall, chatting with other Riley cellar dwellers, and pass through the cluttered metal shop toward the more satisfying labor of the foundry, where hot, liquid bronze is only one material most people wouldn’t touch with an iron rod. There amid piles of brick sits a plastic bucket of horse manure and a flowerpot full of human hair, much of it clipped from Sunderlin’s own dark blond locks. Another pail gives off the earthy smell that emanates from the mud alongside streams and lakes. This is Sunderlin’s loam, and while he’ll joke that it’s dirt cheap, to him it is the most valuable material of all. It took him three years to find it and to work out the precise mixture of loam, dung, hair, clay and silica sand he uses to make molds. “I’ve never tried so hard to make something work and failed so many times,” he says. It was but one step in unearthing a craft that has been passed from master to apprentice since the Middle Ages and was practiced but never flourished in this country. “When I’m here, I work on bells; when I go home at night, I read about bells. When I sleep, I dream about bells,” he says. That’s how he’ll persevere as the only traditional bellmaker in the United States. Western bellfounding traces its roots to the Campania region of Italy, whence we get words like “campanile” for bell tower and “campanology” to describe both the art of bell ringing and Sunderlin’s unusual field of scholarship. To watch a bell being made with pre-industrial methods is to wonder how anyone ever got it right. The process can take about a month of focused effort, depending on size and ornamentation. The proportions required to produce a particular note and a pleasing sound are exact. Bells are complex instruments that can emit hundreds of partial tones, Sunderlin says, but five distinct partials must be tuned properly for the strike pitch — the term for what laypeople hear when a bell is rung — to sound right. One remarkable pair of 17th century craftsmen, Francois and Pierre Hemony, guarded their superior tuning secrets unto their respective graves and, Sunderlin says, produced bells that needed no tuning at all. “That is an art that is really lost,” he adds. “No one understands how they were able to do that.” Absent that rarefied knowledge, it took founders another 200 years to perfect modern tuning methods. But that’s jumping ahead. Casting a bell means pouring a molten alloy of 80 percent copper and 20 percent tin into a mold like that tall, beany cake. A lot can go wrong, Sunderlin says. The process begins with the construction of the core, the inner “half” of the bell mold. Sunderlin stacks bricks conically around a metal spindle. His loam mixture mortars the bricks together and spreads over the top as, layer after layer, the core assumes the rough, rounded shape of the inside of a bell. Sunderlin then attaches to the spindle a flat, rigid half-silhouette of the bell’s inner surface, called a profile. He turns the profile carefully around the core, sweeping away excess loam and smoothing its surface. Then he dries the core over a charcoal fire and slathers it in a graphite wash to prevent it from sticking to the next layer. That layer, the “false bell,” comprises several coats of a different loam mixture that packs like wet snow. When finished, Sunderlin attaches a second profile, sweeps again to give the bell its familiar outer shape and banding lines and bakes it dry. Then he applies a fine, mahogany-brown coat of microcrystalline wax and lard that he mixes in a Crock-Pot. Once he has affixed hand-carved decorative elements, the result looks like a finished bell made of mud and wax. Several more layers of loam become the outer “half” of the mold, called the cope. Firing the entire mold dries the loam and melts the wax, leaving the impression of the decorations inside the cope and enabling Sunderlin to lift it off. He removes the rest of the hardened false bell with a hatchet. The inner and outer halves of the mold, the core and the cope, are now ready to be sealed together and filled with metal during casting. Hundreds of American foundries once forged bells. Most were small shops owned by Irish immigrants, but Irish casting hadn’t reached international standards, says Peter Hayward of John Taylor & Co., the English foundry where Sunderlin completed an apprenticeship. Consequently, even older, made-in-the-USA bells don’t sing like their European counterparts. The rest of the story is familiar. Changes in culture and the economy compressed bellfounding into a few large operations that left the old ways behind. Sunderlin doesn’t disparage modern firms and praises one American company that makes “carillon quality” bells. 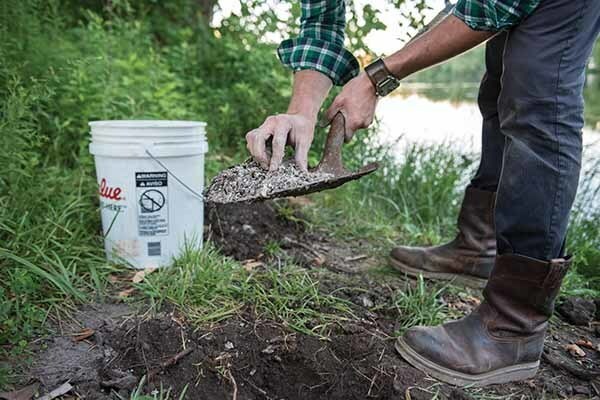 But he does argue that good loam, of the kind he finds about 18 inches beneath the washout basin of a Wabash River tributary near his Lafayette, Indiana, home is best for casting bell metal. Slower cooling in a loam mold, he says, produces a harder, more consistent bell with a finer metal structure. Think of bells as pre-industrial cell phones, Sunderlin suggests. In the Western world, bells marked time and called the prayerful to rest and devotion. They set curfews and warned of danger: storms, disease, foreign armies. Western bells are valued for their sound, which is one reason conquerors from Cromwell to Hitler stripped them from their towers. What better way to demoralize a people than to make the moment of their subjugation the day the music died? And because bell metal is a cousin of gun metal — nine parts copper to one of tin — bells and their makers could be put to work in wartime. The world’s biggest bells hang in the temples of Japan, China and Southeast Asia, where music generally matters less than rhythm and appearance. Russia bridges these broad traditions, forging massive bells such as the Kremlin’s fractured Tsarskiy Kolokol that look Western but sound Eastern. The story of the Great Bell of Dhammezedi, a king in lower Burma, links the hemispheres as well. It seems the enlightened king overtaxed his people and collected more copper than warranted. Rather than give it back and appear ridiculous, he commissioned a giant pagoda bell in 1484 as an expression of piety on behalf of his people. Sunderlin’s retelling stops there. But the bell was later stolen by a Portuguese soldier of fortune dreaming of naval cannons and an expansion of his personal power. At a confluence of rivers, the soldier’s ship splintered apart under the strain of its ponderous cargo, and both sank to the bottom. Dhammezedi’s bell, a Burmese cultural icon, remains in the deep. Efforts to recover it remain entangled in the politics of our day. Most religions hear in bells the voice of the holy; those spiritual overtones fascinate Sunderlin as much as the political. The grandson of a Methodist minister, Sunderlin grew up in a home where discussion of faith was open and searching, devoid of fire or brimstone. But while he could immerse himself in his interests, he didn’t settle easily, eating dinner with one foot on the floor, impatient to get back to work or to play. “Being in church was hard for me,” he recalls. His mother teases that he started his art career on the back of donation envelopes. He transferred closer to home at Indianapolis’ Herron School of Art and Design. Meanwhile, his explorations of Buddhism brought calm and purpose. He contemplated becoming a Zen monk. In a ceramics class, he similarly contemplated the relationships people develop with forms that change them from satisfying shapes into useful objects. The journeyman had also found the missing link between his childhood capacity for wonder and his adult need for identity and purpose. Sunderlin’s quest led to the Taylor foundry in Loughborough, where he studied everything from English loam to the company’s Victorian Era business records to the work of casting a bell. One day an apprentice was preparing to break a bell for its metal. When Sunderlin learned the bell had been made in 1728, he expressed his dismay to the master founder. “We don’t like to do it, because we’re destroying a little bit of history,” he was told. “But the metal is so specific, and it belongs to this industry. And it helps the customers offset their cost.” Captivated, Sunderlin bought some of the metal to cast a 110-pound bell back home. The 1728 bell was cast by the London firm of Lester and Pack, best known as the foundry that accepted a commission for a 1-ton bell from the Pennsylvania Provincial Assembly in 1752. It cracked in Philadelphia on first ring and was twice recast by American metalworkers who had no experience with bell metal. Finally, the Liberty Bell passed over from functioning instrument into the pantheon of great national symbols of freedom when it cracked a third time. Pious legend says it clapped out its last mourning the death in 1835 of Supreme Court Chief Justice John Marshall, one of the last founding fathers. So far, history refuses to certify the tale. No iconoclast in principle, Sunderlin nevertheless says we should feel free to break the Liberty Bell and recast it once and for all. The job requires an occasion suited to the bell’s significance in American civil religion and an American who knows how to do it. Freedom could again ring out for patriotic Americans who may care to learn more about the bell’s history than most know today. But as long as American sensibilities are tied to one broken bell, Sunderlin believes the crack itself erroneously defines our identity. This summer, with the help of Andrew Higson, a former John Taylor executive, Sunderlin and JJ Smith tuned the bell that Sunderlin made with the 1728 metal. They claim to have made history: the first loam-mold bell cast in the United States and tuned to a modern five-partial structure. Does that make Sunderlin a bellfounder? He calls himself a student of the craft with much to learn. Higson says the bell was on par with English standards, but Sunderlin must demonstrate that he can make bells of a consistently high quality at a profitable rate. Casting is dangerous work, but on the morning of August 1, Sunderlin is ready to see the Bell of Good Faith become more than an idea in a grant proposal. Bell metal pours at about 1875 degrees Fahrenheit. 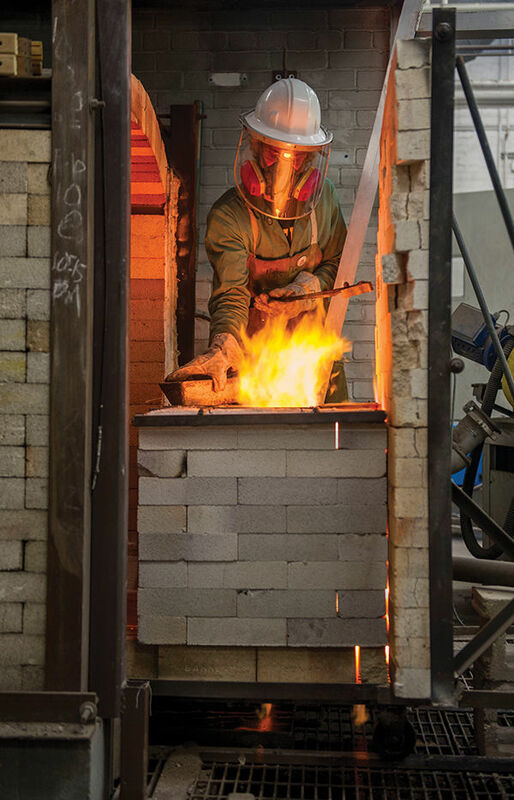 The spun silica gloves Sunderlin and his assistants — research associate Bryce Robinson and sculptor Jake Ollinger ’14MFA — will put on are rated to safeguard them up to 2300 degrees. Flame-retardant shirts under leather aprons and overshirts add protection. Wedge-soled, laceless boots minimize the risk of catching a heel on the grated floor and would let him kick free from an unlucky spray of liquid metal — and agony. During the pour, Sunderlin will don a respirator. Even audiences observing in the safety-controlled environments at industrial foundries need to stay alert. During his visit to a French foundry Sunderlin heard about the pouring of a 6.5 ton bell that went awry. Metal leaked through a crack in the mold, collected in the pit and steamed vapor in the sand, which then exploded. Injuries were few and minor, but Sunderlin is mindful enough of such stories to take nothing for granted. As Sunderlin and his team prepare their equipment, Kate Rogers talks about the cost of bell metal — $5 to $7 a pound — and her father’s Gothic-themed chess set, which Sunderlin used to create the molds for the figures of Sorin, Moreau, Jesus and Mary. After nearly an hour, Robinson lights the propane burner. It streams for a moment until a loud pop indicates a flashback in the line and he shuts off the valve. A few minutes pass. Robinson relights the burner and a butterfly flits through the foundry as sparks rise from the white cinder-block furnace. As the orange heat builds, green flames swirl above the crucible inside the furnace, signaling the oxidization of the copper as it melts. Sunderlin beckons us close enough to see chunks of the Missouri bell tucked into the crucible among the ingots of new bronze. Soon he pokes the metal with a slender steel bar called a tweedler. A plastic visor on his white helmet screens his face from the heat. The metallic air, still breathable, turns smoky as wax beneath the furnace catches fire and Sunderlin tries to smother it with handfuls of sand. Sunderlin tries the pyrometer one last time. Glowing metal clings to its end. He scrapes it off on the grate. “You’re ready to rock,” Robinson says, but the lights flicker out once more. The bellmaker paces while Robinson fixes the fuse. Then Robinson and Ollinger remove the burner and Sunderlin tears loose cinder blocks away from the furnace wall. The crucible inside is angry orange and bright enough to scorch my eyes. Attaching a succession of braces and cables to the automated pulley and gantry crane towering above them, the trio works the bubbling crucible over toward the sand pit. Their speech is animated but inaudible. Their target is a circular opening in a metal box that emerges like a thick steel straw out of the mold buried beneath the sand. Then begins the pour. Translucent molten metal flows and splashes like white-hot water. A tall flame shoots upward. Sparks descend onto Sunderlin’s apron. Jets of bronze fly into the sand. As the stream tapers and the crucible drains, the sand puckers. And it’s over. The empty crucible returns to the furnace, wrapped in flame. Later, Sunderlin will explain it should not be empty. You always melt more than you need, he’ll say. Stepping toward his well-wishers, all 10 of us, Sunderlin removes his helmet, wipes his eyes and slips his glasses on. His fingers, singed through the gloves, are red and swollen. For a moment, his eyes say everything. No bell will emerge from that pit tomorrow. “Alrighty,” he begins abruptly, his face betraying an inner battle to stifle emotion. But he does know. He consoles us with stories. Bellfounders have overcome greater setbacks, he says. Cornille Havard had to re-do a 9-ton bell. John Taylor has recast at least three big bells. Projected to weigh 200 pounds, the Bell of Good Faith is big for Sunderlin in other ways. In time, he calls that day the Great Disaster. But the craft, he says, demands respect. Three weeks before his final year at Notre Dame, with Smith & Sunderlin work orders begging his attention, the craftsman sleeps one night then starts anew. Which confirms what crossed my mind when I saw him that day with his hands in the horsemuck: To see Benjamin Sunderlin work is to witness history. I had come to watch him make a bell. Instead I was watching the making of an American bellfounder. The Notre Dame Bell will ring true one day. I have faith. Originally published by John Nagy ’00M.A. at magazine.nd.edu on October 06, 2014.